Articuno! Pokemon One a Day! 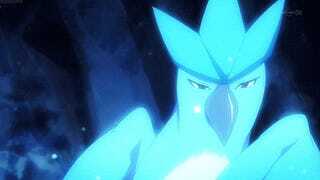 Once upon a time, Articuno was my all time favorite Pokemon. A majestic bird of one of my favorite typings, ice, and the main reason...was because he happened to be blue in color. 10 year old me was a simpleton. But still, I think Articuno holds up on its own as well as being the gateway into the first legendary trio of Pokemon lore. 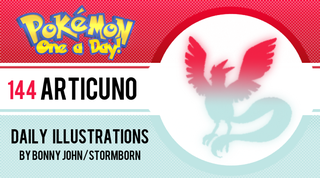 Articuno in my rendition has gone through a number of revisions. I incorporated a lot of features from birds of all kinds. I wanted to base it off a peacock first and foremost, as one of Articuno's defining features is its long, flowy tail. I went through a long neck, thick fluffy body, and all sorts of traits until I got a lean, proud looking creature. I gave it unique markings and translated the headcrest into something a bit more flowy, to match the tail. What I didn't do was give it an owl-like face, which I thought might've been a bit too extreme for the creature. I mean, I love owls and their unique features, but I think I'd lose Articuno in the process. Who knows what it could've looked like..I should go back and check it out later! Eventually, I was having trouble rendering it out so I looked up various indian paintings of peacocks, creatures that live in warmer climates and the like...The total opposite of Articuno. Thus, you will have to forgive the creature and its origin here. I think it works well though- going in between the works and separating it into a 2D form with rendered elements gives a lot of white which reminds you of snow. I had to do justice by this bird that was one of my main companions in my playthrough of Blue version. When that file was erased, I would soon rotate into the next legendary bird, who we shall see tomorrow...Stay tuned folks - and thanks as always for tuning into Pokemon One a Day!